This review is specifically about the mod for Arma 2 called DayZ, since I have yet to actually play Arma 2. Arma 2 was designed to be an authentic army simulator, where you can only carry so many items, weapons and vehicles act similar to how they do in the real world, and you win with tactics not “health packs”. 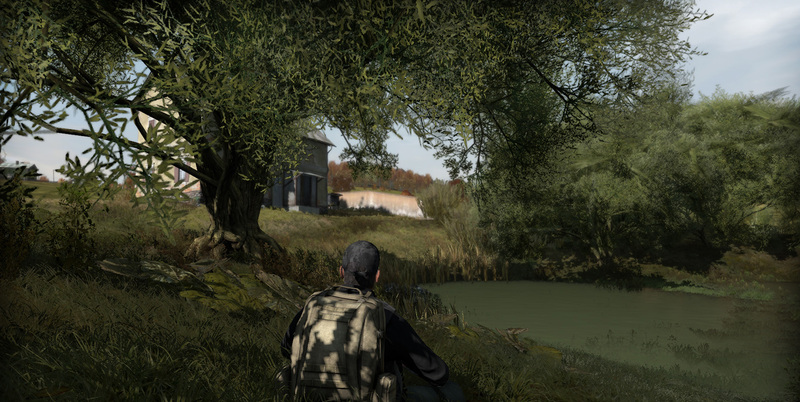 The DayZ mod takes that idea but adds in zombies to the rolling countryside of fictional Chernarus (a russian zone). What is really interesting is that the mod provides no real direction or goal, so it’s up to the player to decide what the “game” is. This leads to a lot of discussion about whether or not DayZ is actually a game, and I’ll leave that to sites like What Games Are. When you start the mod, you are on the beach with only a few basic supplies and no weapon. Typically you are near a city crawling with zombies, and your first order of business should always be to get at least a simple weapon be it a Makarov pistol or a Hatchet. I actually prefer the hatchet since it’s quiet and doesn’t run out of ammo, which is great in towns where you don’t want a zombie horde on you. It’s main drawback is that you have to be in melee distance to use it which means you can get bit and start bleeding. This is one of the biggest concerns in the game, you have a set amount of blood (like in real life), you can bleed out and die (like in real life), but your blood doesn’t regenerate without eating food (somewhat unlike real life). If you are bit/scratched in game and begin to bleed, you will have to bandage yourself, then hunt for some food to regain some blood. There are several other afflictions that can be placed on you each with their own way of being healed, such as breaking a bone, going into shock, and hypothermia/cold. There is a somewhat permanent death, if you die you are dead but you will respawn on the beach (with nothing again) possibly close enough to your corpse that you can run back and loot your items so you aren’t starting from complete scratch. So a second goal is usually to stay alive and be more cautious, you probably won’t kill 20 zombies before they seriously mess you up and possibly kill you, so don’t attract too much attention. Zombies run at the same speed as you so you can’t outrun them in the open, though you can lose them in buildings if they lose sight of you. The biggest concern in the game comes from other players, since this is an online multiplayer mod, each server can support up to about 50 players. When the mod first came out a lot of players grouped up and tried to survive cooperatively, but after a slew of YouTube videos showing how players ultimately got double crossed by their former buddies it has basically reduced to either “play with people you really know” or “shoot on sight”. This is similar to what you see in The Walking Dead or other zombie/apocalyptic movies, tv, and books. Get a great weapon if you didn’t already find one, something like a crossbow is quiet but has a decent range and you can usually recover your bolts so it doesn’t have the same kind of ammo issues as guns. There are other silenced weapons but they aren’t as common as the crossbow and you run the risk of being killed by another player looking for them. At this point I usually just look for things I don’t have, including camo clothing or a ghillie suit to better hide from players. After I have just about everything I need to survive I start to venture out further in search for crashed helicopters or military bases to find high end weapons and hopefully night vision goggles (which I have yet to find). The really long range weapons are typically loud (except the silenced sniper) and are generally only useful for player killing (a gunshot that rings out for 100 metres is a good way to ring the dinner bell for nearby zombies). As a target of opportunity, if you happen across a broken down vehicle you can check what needs to be fixed and start collecting parts (I would recommend keeping the parts you find before you have a vehicle to fix since the parts take up a lot of space). We fixed a tractor and had a fun ride around on it, we found a motorcycle that someone else had fixed up as well. … Honestly I don’t know what to do at this point (which is pretty much where I am), since in my mind I’ve done just about everything I don’t have any new goal. I could try to up my kill count, but it resets when you die and there aren’t leader boards or anything so it seems pointless. I still haven’t found those NVG so I could still hunt for them, but other than that I think I’m done. DayZ is remarkably serene at times, just walking through a field with the birds and wind blowing you can almost forget that there are bandits or zombies. I can definitely see myself playing this mod again at some point even though I’ve pretty much stopped playing now I keep it installed. I got about 30+ hours out of this game (about $1/hr) so it was definitely worth playing and since it is just a mod (which is free) I still have the actual Arma 2 game to play through for that price too. Without playing Arma 2 I can’t recommend it, but I can definitely recommend DayZ if you already have Arma 2 or are willing to buy it to play this mod.